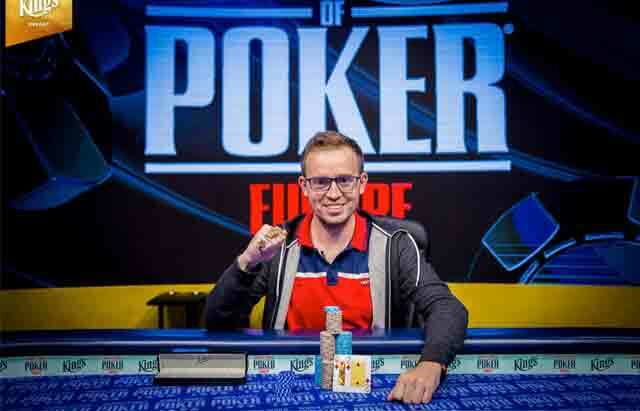 Mykhailo Gutyi took down WSOP Europe Event #4 (€1,100 Turbo Bounty Hunter) For Over €61K. As Event #3 (€550 Pot Limit Omaha 8) of the 2018 World Series of Poker Europe reached the final table and suspended play for the evening, Event #4 (€1,100 NLHE Turbo Bounty Hunter) played 13 hours straight, right through to a winner. Mykhailo Gutyi from Ukraine was that winner. He outlasted the 387 player field to take home the €61,299 first place prize and his first WSOP gold bracelet. In addition to the normal payouts, players received €300 from the prize pool for every player they eliminated and Gutyi provided his fair share of the knock outs earning 16 additional bounties. The first of the final table to fall was Italy’s Luca Marchetti. With fewer than 10 big blinds Marchetti open shoved holding the . Florian Sarnow looked down at and reshoved for more. The flop came out providing Marchetti with two outs to the straight. When the turn came Marchetti was drawing dead. The inconsequential river was the and Marchetti fell in ninth place for €3,765. Minutes later Andrey Ivlev was forced to push his final two big blinds in the middle while under the gun holding . From the small blind Vangelis Kaimakamis reshipped his final six big blinds with . The flop was putting Kaimakamis way ahead. The turn opened the door for Ivlev, but the completed the board ending Ivlev’s tournament in eighth place for €4,904. The hits kept coming with the turbo structure as the now short stacked Philipp Zukernik moved in from the big blind holding over the open raise of Gutyi. Gutyi raised with and so when the board ran out , Zukernik hit the rail in seventh place for a €6,531 payday. The very next hand claimed Kale Halstead’s tournament as he shipped his short stack with . Gutyi got involved in back-to-back hands making the call with his . The board ran out giving both a flush. However, Gutyi not only held a heart in his hand for a higher flush than the board provided but he actually held a straight flush to win the hand. Halstead was eliminated in sixth place for €8,891. Darko Stojanovic was the next to bounty to be claimed as he three-bet shipped 10 big blinds from the big blind over a button open from Kaimakamis. When Kaimakamis called Stojanovic was forced to show down the which was in rough shape against Kaimakamis’ . The flop brought a set for Kaimakamis in the form of a flop leaving Stojanovic drawing dead and out in fifth place for €12,367. The speedy eliminations continued as twenty minutes later Angelos Pettas hit the rail. Under the gun, he moved all in holding . Gutyi took a moment but made the call from the big blind holding . The flop came giving Pettas some extra outs as he paired the four. However, the board ran out which was of no help to Pettas and he earned a career-high cash of €17,565 for his fourth-place finish. Gutyi, who held the chip lead three-handed, shipped his stack from the button holding . Kaimakamis spent about a minute in the tank before making the call for his tournament life with . Dominated, Kaimakamis needed some help. The flop of didn’t change anything. The on the turn left Kaimakamis drawing to a ten. The fell on the river and Kaimakamis settled for third place and went home with €25,468, his second cash of the 2018 WSOPE. At the start of heads-up play, Gutyi held a 3.5-1 chip lead over Germany’s Sarnow. Although Sarnow had doubled through Gutyi on the second hand of heads-up play, Gutyi still held a slight chip advantage when the final hand went down. Sarnow limped the button with the and Gutyi checked his option holding the . The flop was a dangerous one as it came giving Sarnow top pair and Gutyi the flopped flush. The action went checked around. When the rolled off on the turn all the chips made their way into the middle. Gutyi bet, Sarnow raised, Gutyi shoved and Sarnow called it off needing spike an eight for the board to pair to survive. The river ended the tournament with Sarnow finishing as the runner-up for €37,678. Sarnow made two WSOP Europe final tables in one day. He made the final table of Event #3 earlier in the day and then late registered for Event #4. He will return tomorrow to compete in the €550 Pot Limit Omaha 8. Gutyi takes home his first WSOP gold bracelet and the first place prize of €61,299 for a career-high cash.